I've been quiet on here for a while - mostly because my creative energy has gone into planning my own wedding back in October. I designed all of the stationery from invitations to service sheet to place settings - see below. Inspiration came from our overgrown back garden, pictures of ivy covered buildings, and various collage artists that I've always liked - Rauschenberg, Joseph Cornell, etc. ​I was also inspired by a series of collages by Lee McKenna (left) as I thought they combined foliage with ephemera well. I scanned in some ivy leaves (see below) to collage but then thought it would be a shame not to draw them myself so did some paintings of ivy in colour and black and white, that I then used throughout the wedding stationery. I made several pages of mini collages that I was then able to select from and combine with the ivy for other sections of stationery. These required a lot of touching up and minor colour edits until I was happy with them. There was also a long process of experimenting before I was happy with how to combine the collage and ivy sections with text. In the end I used a font called 'Angel Tears' (yep...) as the basis for the calligraphy text, but traced it myself so I could make some of the letters look better. The plain serif font used was 'Fontin'. ​I drew a map for the inside of the invitation, and also one of the inside of the reception venue for the service sheet. I also designed envelope liners but we never used them (stationery madness). I've blurred personal details but hope you get an idea from the images below - click to see full images and captions. It's left a bit of a vacuum in my creative life now it's over but I'm looking forward to starting some new projects and getting back to commissions. I really want to go travelling! I've been working for a while now on an altered book project with talented friends Hannah Hunter-Kelm (illustrator/printmaker) and Ella Dickinson (photographer) - click here to see previous blog posts. I thought I might use this blog post to show my process as I worked on my latest contribution to the project. The book we've been working into is the lovely Dream Days by Kenneth Grahame, illustrated by E H Shepard - it lends itself well to the project as the narrative contains many interesting phrases that inspire a visual response, and Shepard's silhouette illustrations can be incorporated into our own contributions or add to the overall feel of the artwork. I've been using a lot of collage during this project - I love collage and don't get the opportunity to use it that often in commissions so I've been taking this as an opportunity to do so. It has also been interesting to work with Hannah and Ella as artists who have very different approaches. Part of the challenge for me has been to think forward to what they might add to the pages and part of the enjoyment has been to see how they interpret the project. Hannah's style is much more colourful and playful than mine (I tend to use black and white or limited colour palettes), and she experiments more. Ella uses her photography to complement the text, and draws out social justice and current event themes that add a new dimension to the book. I try and keep this in mind as I work on the book and prepare pages for them. Click images above to see in full. Left: An interesting phrase had been left framed by some striped paper - I removed the paper as I thought I'd like to put something surrounding the phrase that fitted more with the text. Right: I usually then go through the next few pages and highlight any particular phrases that I find interesting. 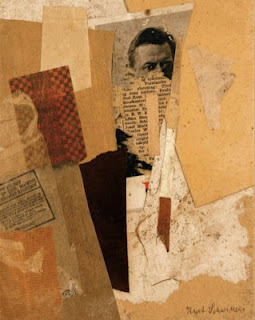 I was pretty sure I had some collage images that showed destruction after a tornado - the phrases I'd been looking at conjured up ideas of rubble and dust. I also found a black and white image (from a leaflet I picked up at the Wellcome Collection) of a flat landscape that I thought would work for the following page, and complimented the other collage pieces in terms of colour and texture. The image with the mushroom cloud is by Walid Raad. For the 'escape' page - I decided the mushroom cloud picture would work best as it would split well across the double page spread. I decided to work into it more - mostly because I wanted to make the page 'mine' rather than just the work of another artist. Above: work in progress using my favourite materials - white gouache, ink and pencil. Above: final page spread. I added in some black lines with a brush pen and worked into the background a bit more. I also completed a few more spreads that you can see in the gallery below. Click to see the full images and scroll through them. I left the last couple fairly minimal as I thought that Hannah and Ella might see some ways to work into them further. There are no real rules in this project - we all seek to respect each other's work but we can work into pages that another has done, so it will be interesting to see where they add more. Hope this was an interesting insight into one aspect of my work - let me know if you'd like to see more posts like this! My third contribution to a joint project with sisters illustrator Hannah Hunter-Kelm and photographer Ella Dickinson (click their names to see their online portfolios). We've been working on this for nearly a year now, adding artwork, collage and photography to a second hand copy of 'Dream Days' by Kenneth Grahame, with illustrations by Ernest H Shepard. We then post it to each other, and can start new pages, tear pages out and add to each others' work. I'm hoping to scan in the whole book at the end to upload - as the first person in the cycle, my artwork is usually worked into by the others and so it evolves and changes, so it might be interesting to see the book as a whole (and of course to see Hannah and Ella's work too). Above: another London sketch from a sneaky bus photo - pencil, gouache. Very excited to say that I have just sent some postcard designs for printing - they will be available to buy as a set of 5 (all different designs) in lovely gesso paper, price tbc. Watch this space! My parents love property development - they're doing up their new house right now, and as their birthdays are just a week apart I made them a joint present of a decorated folder to keep all their plans and photos together (above - gouache and collage on paperchase folder - taken in bad lighting so not great colours, sorry). I also made a matching card (below). My second set of pages for the altered book project I'm working on with illustrator Hannah Hunter-Kelm and photographer Ella Dickinson. This first set of pages (above) was inspired by the work of designer Martin Venezky. I'm enjoying the opportunity this project gives me to do some more collage work, and the existing illustrations and text are more inviting to work into than an intimidating white page. I collect (/hoard) paper and images but I don't collage as much as I would like. Here are some collage pieces that I've done fairly recently.